Royal Challengers Bangalore (RCB) take on Kings XI Punjab (KXIP) in the Indian Premier League match 28 at the Punjab Cricket Association IS Bindra Stadium in Mohali. Having lost six matches on the trot, RCB has been the target of social media trolls for their winless campaign thus far. The Virat Kohli and Co are looking for their first win of the season and will be hoping to find it against KXIP as they meet them for the first time this year. Meanwhile, just like every RCB match day, fans took to Twitter and Instagram to post memes trolling the team. Kings XI Punjab vs Royal Challengers Bangalore Live Cricket Score. While Royal Challengers Bangalore are currently placed on the last spot on the IPL 2019 points table, their opponents for the night, Kings XI Punjab, are on the fifth spot with four wins from seven matches. 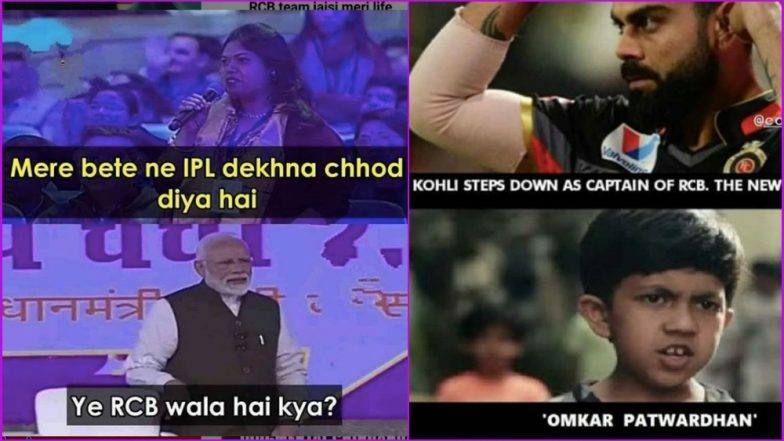 Meanwhile, ahead of RCB’s match against KXIP, funny memes have started doing rounds again. Check a few of them below. Enough of Funny RCB Memes! An Open Letter to Virat Kohli Haters From Royal Challengers Bangalore Fan. Meanwhile, South African fast bowler Dale Steyn has joined the Royal Challengers Bangalore squad and the team will be hoping that helps stay afloat team’s sinking ship. It will be interesting to see if Steyn features in tonight’s match or not. KXIP vs RCB, IPL 2019 Match 28, Key Players: Chris Gayle to Sam Curran to Virat Kohli, These Cricketers Are to Watch Out for at Punjab Cricket Association Stadium. This will be RCB's fourth away game of the season. In three matches away from home, RCB faced defeats against defending Chennai Super Kings (CSK), Sunrisers Hyderabad (SRH), and Rajasthan Royals (RR). At home, RCB has been outplayed by Mumbai Indians (MI), Kolkata Knight Riders (KKR) and Delhi Capitals (DC).